Oh dear! Nigerians might not know the truth, but ofcourse, Senator Bruce will. Aside being Dino Melaye's colleague, Senator Bruce is also a close friend of the Senator. Yesterday he publicly said the Senate has not been the same without Melaye (and we totally agree with him, even though we are not Senators or in the senate) you already know why. 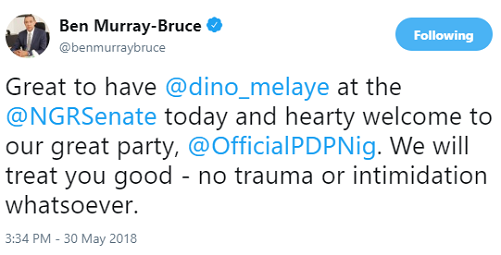 And today, After Melaye's shocker, Bruce tweeted it was great to have Melaye at the Senate today and then went ahead to welcome him to his party, the 'Great PDP.' Lol.